Father’s Day is Sunday, June 19, 2011. Consider doing something different and special this year with your dad. Head to the Olympic Peninsula for a day of fresh air and fine Washington State Wine. Enjoy a glass of wine in the gardens at Camaraderie Cellars. Discovery Bay Golf Course is about 5 miles outside Port Townsend. 18 holes and gorgeous views of Discovery Bay and the Olympic and Cascade Mountains. Cedars at Dungeness Golf Course, in Sequim, is the driest course in Western Washington. The Olympic Mountains stand tall in the distance. Sunland Golf Club is fun to play. Tall sequoia, fir, spruce and cedar trees line the course, which also has great views of the Olympic Mountains. Peninsula Golf Club sits on a hill east of Port Angeles. It overlooks the Strait of Juan de Fuca, and the Olympic Mountains stand at its back. Wine and cider tasting is the perfect activity after a morning round of golf, and the Washington Wineries of the Olympic Peninsula provide it. Four wineries offer wine tasting in Port Angeles, two wineries offer wine tasting in Port Townsend, and there are two winery / cideries between Port Townsend and Port Angeles. 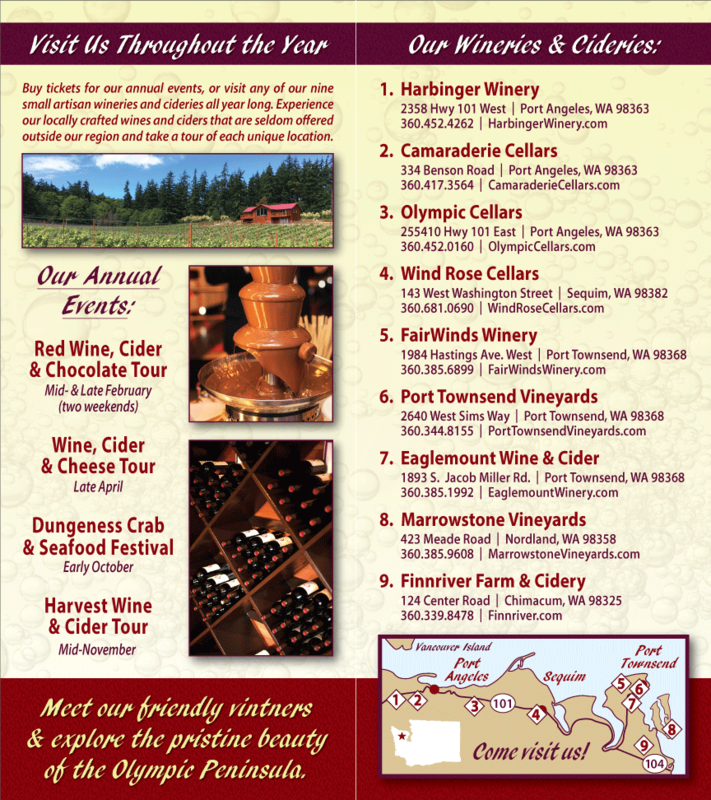 See our Olympic Peninsula Wineries map for more specifics. Spend a day or two on the Olympic Peninsula with your dad, this weekend, June 18 or 19, 2011. If this weekend, is already booked, consider another weekend. Opportunities for outdoor recreation are abundant – golfing, kayaking, hiking, biking, etc. ; and no matter what activity you do, save time for wine tasting on the Olympic Peninsula.